1. Use a vegetable peeler to shave the carrot into long strips. Peel strips from the cucumber so that it’s striped, then cut in half lengthwise and thinly slice crosswise. 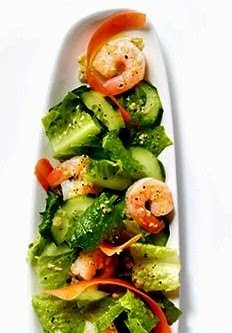 In a large bowl, toss the lettuce, carrots, and cucumber. 2. In a large skillet, melt the butter over medium heat. Add the garlic and cook for 30 seconds, stirring. Add the shrimp, sprinkle with salt and pepper, and cook, stirring, until just opaque throughout, about 7 minutes. Remove from the heat and cool slightly. 3. Toss the shrimp and its cooking juices with the vegetable s until well coated. Toss in the lemon juice and season with salt and pepper.